This can be a life-changing Event. Just Google "NPFinancials". This can be a life-changing Event. Just Google “NPFinancials“. You will come to know all you need to know to become successful in exploring the possibility of a passive income by Trading. 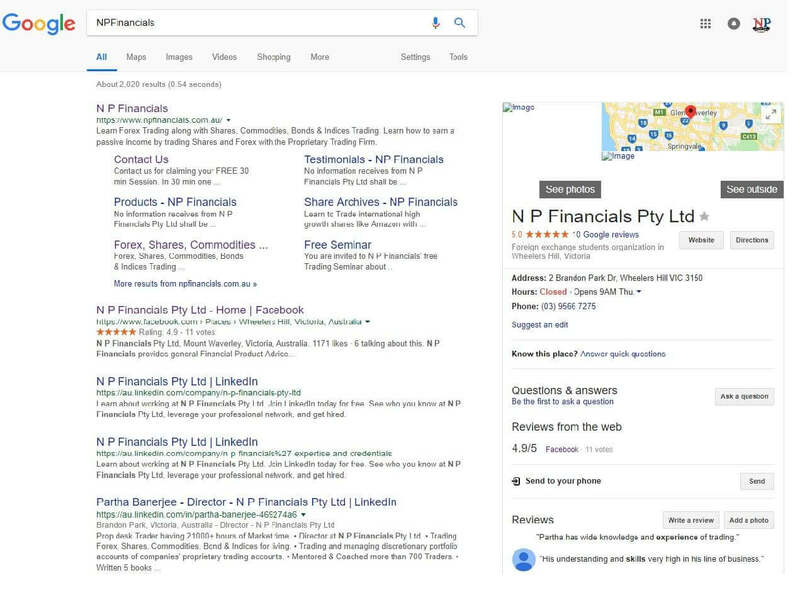 At N P Financials (https://www.npfinancials.com.au/) we share our proprietary knowledge and expertise with retail and wholesale clients to provide them an opportunity to explore the possibility of earning an extra income. We are a Proprietary Trading Firm operating out of Melbourne. Our main services are coaching and mentoring to open-minded, positive and interested people to help them earn passive income while keeping their day job. At N P Financials (https://www.npfinancials.com.au/) we believe in Simplicity in our Trading pathway. Our idea: if it is not Simple, it is not working. We strive for Excellence in Trading, which is delivered to our clients. Our Proprietary Trading Strategy will guide you through every step of your trading in a blue chip Shares, Forex, Commodities like Gold, Oil, Bond and Indices e.g. DAX, ASX200, Dow Jones to explore the possibility of earning second income. Learn what all other National and International CFDs we are Trading in our different Asset Classes. Develop yourself as a professional trader capable of capturing extra income in future with us. To know how to Trade different type of Markets, whether in Range or in Trend, in future, please book your 30 minutes FREE session with us at Level 3, 2 Brandon Park Drive, Wheelers Hill, Victoria 3150. Trade Share (Rio Tinto) with us. Our own ASX listed share: Rio Tinto Ltd is at a very critical position now. Trade Rio Tinto shares with us from here……….